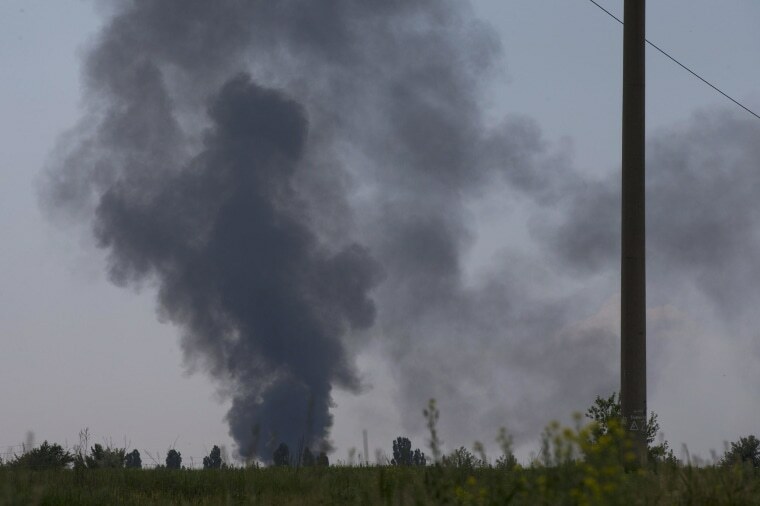 Pro-Russian rebels shot down a Ukrainian military helicopter Thursday, killing all 14 people on board including an army general, acting President Oleksander Turchinov told parliament in Kiev. The separatists used a portable air defense missile to bring down the chopper amid heavy fighting around the eastern city of Slovyansk, Ukraine’s outgoing interim leader said. The crash itself was witnessed by the Associated Press. Slovyansk has become the epicenter of fighting between pro-Russia insurgents and government forces in recent weeks. Located 100 miles from the Russian border, it has seen constant clashes and its residential areas have regularly come under mortar shelling from government forces, causing civilian casualties and prompting some residents to flee. Also Thursday, an insurgent leader confirmed that his fighters were holding four missing observers from the Organization for Security and Cooperation in Europe and promised that they would be released shortly. Vyacheslav Ponomarev, the self-proclaimed "people's mayor" of Slovyansk, told the AP that the monitors — who are from Turkey, Switzerland, Estonia and Denmark — were safe.